Clearing Super Mario World in just over thirteen and a half minutes is a stellar achievement no matter what. 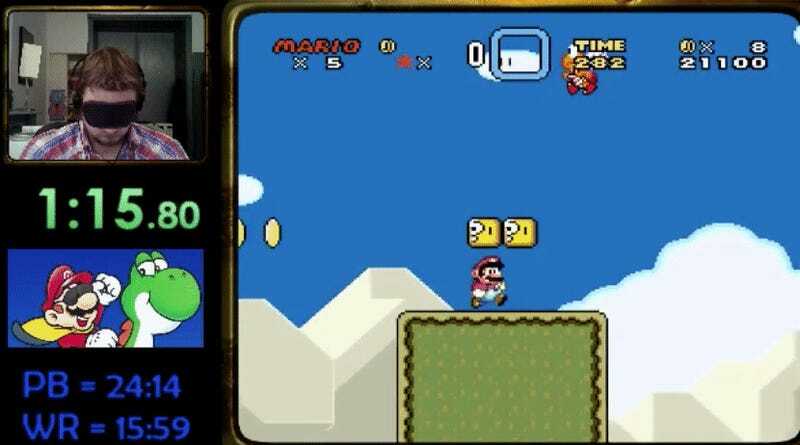 One speedrunner took it to the next level by achieving that time while wearing a blindfold. Katun24 is a speedrunner known for titles like Super Mario World and Donkey Kong Country 2: Diddy’s Kong Quest. While he normally plays through these games with all of his senses, he occasionally takes up a blindfold for some extra challenge. This usually leads to very long runs—his blindfolded run through Donkey Kong Country 2 took over sixteen hours to complete. Thankfully, his blindfolded run through Super Mario World was much quicker. The run followed the 11 Exit route, a category that tries to beat the game as fast as possible. Katun24 leaps and slides his way through levels, all while searching out hidden exits that will bring him to the final boss fight against Bowser in the shortest amount of time. It doesn’t always go perfectly: in one underwater level, he loses his bearings and doesn’t swim high enough to avoid sinking to his death. But the run is otherwise mesmerizing. Katun34 accomplishes in a handful of minutes what would take most players multiple gameplay sessions. Blindfolded runs are common in many games. Runnerguy2489 managed to beat The Legend of Zelda: Ocarina of Time in a 108 hour blindfolded run, part of which he showed off at the AGDQ 2015 charity marathon. Sinister1 managed to knock out all opponents in Mike Tyson’s Punch-Out. Without sight to guide them, blindfolded runners need to navigate games based off specific variables such as the distance their character causes when performing certain actions or the sounds of nearby enemies. It’s why you see Katun24 run into walls and then leap back to doors; he’s taking advantage of the distance Mario travels when jumping backwards. Katun24’s run managed to achieve a world record for the blindfolded category and improved his personal best by over ten minutes. It’s the first step of his Jedi training. and I can’t wait until he finally defeats the Empire. Blindfolded, of course.